So far, public interest in a trio of controversies connected to the Obama administration has been limited. Roughly a quarter (26%) of Americans say they are very closely following reports that the IRS targeted conservative groups. About the same number (25%) are tracking the Benghazi investigation very closely, and even fewer (16%) are very closely following news about the Justice Department subpoenaing phone records of AP journalists. The new survey by the Pew Research Center, conducted May 16-19 among 1,002 adults, finds that 37% of Republicans are paying very close attention to the IRS story, compared with 21% of Democrats and 25% of independents. And the Benghazi investigation continues to draw much greater interest from Republicans (34% very closely) than Democrats (18%). A historical review of previous controversies involving White House or cabinet officials finds that these levels of public interest – and the partisan divide in attentiveness – are not necessarily new. 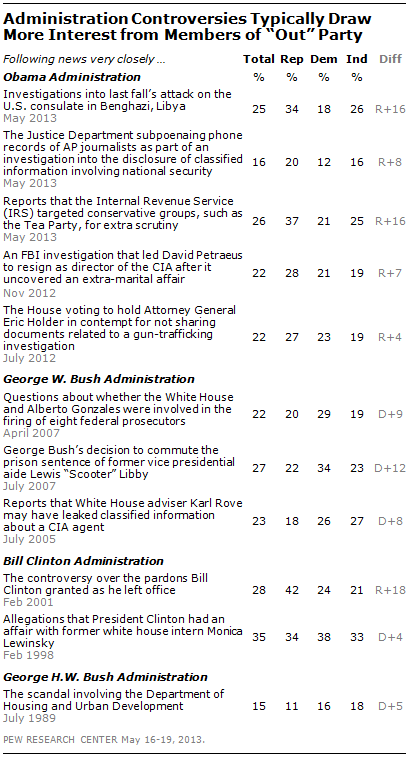 Previous scandals – such as the Lewis “Scooter” Libby case during George W. Bush’s administration or the “Pardon-gate” scandal at the end of Bill Clinton’s second term – received similar levels of public attention, and were generally more interesting to those in the opposition party. 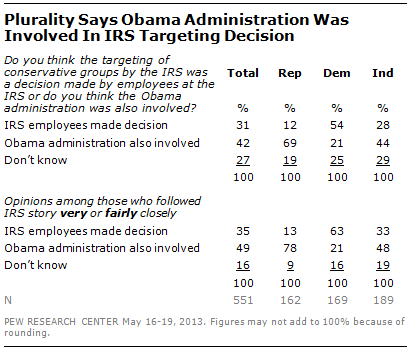 Overall, 42% say the Obama administration was involved in the decision to target conservative groups. Fewer (31%) say that the decision to target conservative groups was made by IRS employees without administration involvement, while 27% offer no opinion. Not surprisingly, opinions about this are highly partisan. Nearly seven-in-ten Republicans (69%) say the administration was involved in the IRS’s decision to target conservative groups, compared with just 12% who say the decision was made by IRS employees. By contrast, just 21% of Democrats say the administration was involved, while 54% say IRS employees made the decision to target conservative groups. 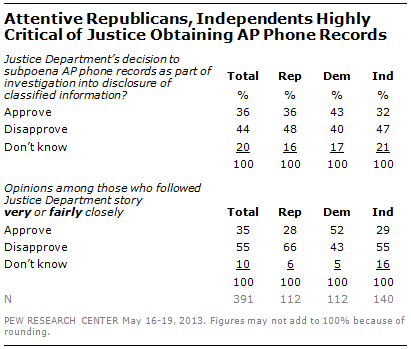 By a 44% to 28% margin, more independents say the administration was involved in the IRS decision than say it was not. Those who followed the IRS story at least fairly closely (50% of the public) express similar views about the administration’s involvement: 49% say the administration was involved while 35% say it was not. But partisan differences are wider among this attentive segment of the population; fully 78% of Republicans who have followed the story believe the administration was involved in the decision to target conservative groups, while 63% of attentive Democrats say the decision came from IRS employees. The public is of two minds when it comes to the Justice Department’s decision to subpoena the phone records of AP journalists as part of an investigation into the disclosure of classified information. Slightly more disapprove (44%) than approve (36%) of the DOJ’s actions. The Pew Research Center has been tracking public interest in news stories for more than two decades, and while each political scandal is unique – and the list is hardly comprehensive – the level of public and partisan interest in the current affairs is largely consistent with prior events. At their peaks, about a quarter of Americans very closely followed controversies involving Alberto Gonzales (22%), Scooter Libby (27%) and Karl Rove (23%) during George W. Bush’s administration. All three drew more attention from Democrats than Republicans. The “Pardon-gate” controversy at the end of Bill Clinton’s presidency was followed very closely by 28%, with far more interest from Republicans (42%) than Democrats (24%). The exception to this partisan gap was the public’s first reaction to the Monica Lewinsky story. An early February 1998 survey found 35% following very closely, with high levels of interest across party lines. However, the partisan gap in interest in allegations against Clinton increased during impeachment proceedings later that year.